Cold and snowy season has arrived, It’s time for little warmth, love and peace, it’s time for little fights and cheers, and it’s finally time for the 4th Global DMS Alumni Meet. Block your calendars for 22nd December 2012 between 4-7pm at DMS, Mysore School quadrangle for a fun frolic filled evening accompanied with dance and music. Let us go back to the days when we stood on the stage amongst hundreds of people with lights flashing and legs trembling School Day performances. Wake up your old pals and drag them along. Family of the alumni are also welcome to the event. 4:00- Assemble at school quadrangle. 4:00-5:00- Year wise photo session. 6:00-7:00- Alumni Exec body updates and election for office bearers. 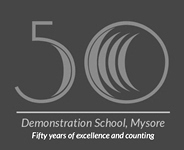 DMS, Mysore is hosting INDEM this December and hence, Vivek Memorial has been scheduled for the second week of January and is sponsored by DMS Alumni Trust. Our proud patron's Mr. Aashu Calappa (Batch of 1982) and Mr. Rajeev Natraj (Batch of 1974) have generously donated an amount of 25,000 INR and 10,000 INR respectively towards alumni activity; And we look forward for more patron's to reach out to our proposed plans for DMS, Mysore school students.